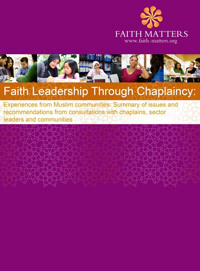 This is a report that outlines the views of Muslim chaplains, sector leaders and Muslim communities as well as other faith communities on faith leadership. This work was undertaken over a 7 month period and took in a number of key organisations that work with Muslim and other faith communities. This is a unique report that looks at the provision of chaplaincy and pastoral care services within the following sectors: The NHS, Higher and Further Education sectors and the Prison Service. The report also outlines the growing chaplaincy and pastoral skills base that is growing within Muslim communities and this is a mechanism through which all faiths can support people when they are going through traumatic or turbulent periods in their lives.